Our unique Radiant Edge LowSlope ice melt system is designed for ice dam and icicle prevention on roof applications down to 1/4″ in 12 slope. It is ideal for stopping icicles and ice dam formations on all flat or near-flat roofs, including metal roofing, built-up roofs, EPDM, PVC, APP and SBS roofing. It may also be customized to fit any plumb or square fascia with different roof slopes to accommodate special needs. 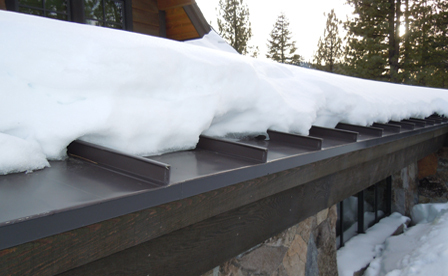 Our exclusive design isolates the roof ice melt heating system from the fascia. This maximizes heat to the top melting surface, minimizes heat loss, and provides a very energy-efficient roof edge ice melt system. 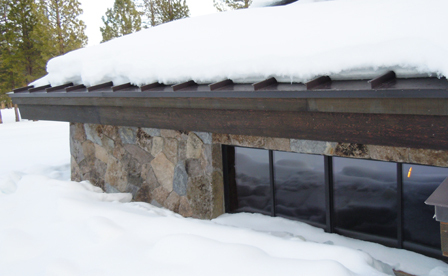 The positive drip keeps runoff away from the fascia, and finally makes it possible to integrate a heated gutter system to safely carry the melt water through the downspout system. Installation is easy. The integrated base panel and heavy extrusion are first attached to the roof. Heater cables are then installed in the base. The Panel Cover interlocks with the base panel and has a finished painted surface or is pure copper. The system is then counterflashed by the roofing materials. Select Radiant Edge LowSlope for all your low pitch and flat roof projects where ice dam and icicle control is needed. To minimize ice dams and icicle formations on flat roofs of metal, APP, SBS, EPDM, PVC, tar and gravel, etc., even low pitched composition shingle roofing. 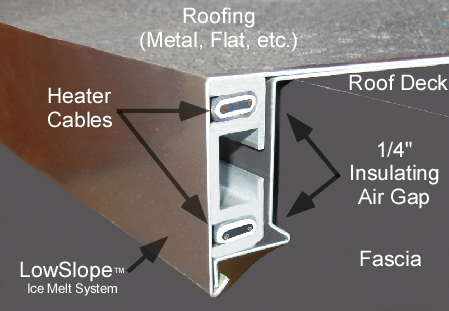 May be used on any slope where the heating element is desired on the fascia, not on the roof plane. May be customized to fit plumb fascias at any slope to accommodate special needs. Like the Radiant Edge and Radiant Edge LT, it enables gutter and downspout systems to safely carry away melt water.